And so it was that on August 16, I8I5 when one era was closing in Europe with the exile of Napoleon, and the Industrial Revolution was clanging another open, "a man was sent by God whose name was John." He came to the scrubby stone cottage of Francis and Margaret Bosco on the hills of Becchi, at the foot of the Italian Alps. "A fine healthy baby," the neighbors all agreed, "fit for the soil, to take his father's place on the old homestead." But no one went further than that in predicting the child's future. Francis died only two years after John's birth, leaving Margaret to raise three boys by herself. She taught them that they each needed to carry his weight and help with the keep of their home and farm. There were house chores to do, firewood to cut and gather, fields to plow, and crops to tend. Little John and his older brother Joseph, supervised by their stepbrother Anthony, tackled the endless work with energy. Margaret taught them that work was a privilege and that joy would make the work lighter. She was a woman of character and tenderness. All who knew her called her Mama Margaret. Fathomless was the love she showed her sons, not in coddling words but in deeds; innumerable were the lessons in upright living, Christian fortitude, and fear of God, which she taught by her example. A pillar of goodness, she stood before them as sturdy as the very Alps. At her knee John first heard the voice of the Master calling him to a special assignment. It was a low insistent voice, an urge that once in a while manifested itself in a sudden outburst, like the time Margaret and John were walking along the countryside and met one of the local priests. "Hello, Father," cried the boy, to be acknowledged only by a curt bow of the head. Deeply hurt, he complained that the priest had hurt his feelings. Again the voice urged John to go among the farm boys, not just as a playmate but as a leader. More than once he came home with a battered cheek or torn shirt and in explanation would say, "But, Mama, those boys aren't really bad. They just don't have a good mother like I have, and they don't know their catechism, and their parents don't take them to church. When I'm with them, they behave better. Please, Mama, may I go with them?" Soon the child took over completely, as God's plan called for. He learned the tricks of magic from traveling showmen. He juggled. He walked the tightrope. Then he opened his own carnival show. Admission: one rosary to be recited by all spectators; added attraction: the Sunday sermon, repeated by the little ringmaster. The show grounds were the field in front of the house, where Margaret Bosco often watched her son at work and wondered what might come of it all. When John was nine, the Master called him openly. A mission as important as his could not be left to a mere urge. In a "dream," John found himself fighting a large crowd of rowdy lads who were cursing and carrying on abominably. He tried to stop them, but they refused to listen to him. Suddenly, a Man appeared, who motioned to John and said, "Not with punches will you help these boys, but with goodness and kindness!" "Who are you?" gasped the astonished boy. The Lady's answer came to him, ever to resound in his heart, to be repeated audibly several times in his life, "This is the field of your work. Be humble, steadfast, and strong!'" John now knew his vocation. But the priesthood meant studies, and there was no money on the Bosco farm. Even school was almost impossible. Due to the goodness of a farmer who taught him, John learned to read and write and do sums at the age of eight. His first schooling came the next year, when he hiked some three miles every morning to the country school of a priest. But the increasing hostility of his stepbrother, not pacified by John's attempts to put in extra hours on the farm, made life at home unbearable. And so, for the sake of domestic peace, Margaret Bosco divided the paltry estate left by her husband and allowed her youngest son to go to Castelnuovo to attend public school and board with a good family she knew. Alone in the town, John soon learned the hardships of an orphan's life. He worked after school to support himself. Though he was only 15, he labored in a blacksmith shop, then as a tailor, a waiter, a pin-boy in a bowling alley, a shoemaker--anything to get a few pennies and ease his mother's burden. Throughout his school work John did not lose sight of his vocation which was now, more than ever, an actual conviction. "I'm going to be a priest," he told his friends, "and I'm going to give my life to the care of boys!" The beautiful Lady of his dreams was not slow in showing Don Bosco (Don is the title given to priests in Italy) just what she expected him to do. On the feast of Mary Immaculate, December 8, 1841, the first sign came. While vesting for Mass, the priest heard the sacristan shrieking at a poor young boy who had sneaked into the church to get warm. "Here, call the boy back," cried Don Bosco, "he's my friend!" The boy came over to Don Bosco. "How old are you Bartholomew?" "I'm a bricklayer," he responded, head lowered. "Your mother and father..." Don Bosco continued. "I'm alone," the boy responded sadly. "Can you whistle?" Don Bosco broke in. "Of course I can whistle!" exclaimed Bartholomew laughing. 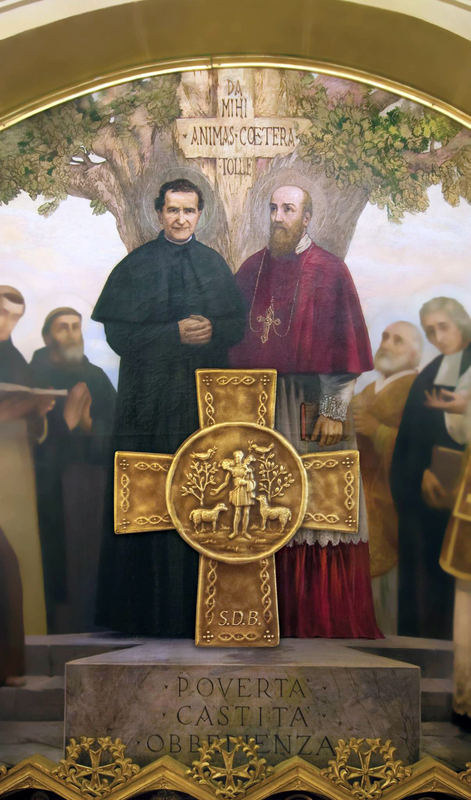 And that friendship, struck up on the spur of the moment, began Don Bosco's worldwide ministry to bring young people to God. He told Bartholomew to stay for Mass. After Mass Don Bosco told the boy, "Next Sunday, bring your friends here, and we'll spend the day together." "But my girls!" exclaimed the directress of the girls' orphanage where Don Bosco was chaplain, "What will become of them?" "You can always find a priest for them," said Don Bosco, "these boys, they need me!" With his heart full of trust in his Lady and his pockets empty, Don Bosco courageously took up the work. From then on, it was only "Give me souls--the souls of young people." Don Bosco called his weekly band of ragged young people "the Oratory," a term which to his mind suggested prayer and organized recreation. In the beginning it was a floating thing, its membership growing daily in large proportions. There was no one place to meet because in those troublesome times people were afraid of a large group of working boys and besides, who relishes the uproar of some 200 boys enjoying a day's freedom from the imprisonment of a factory? Every Sunday they would meet in a different place, a city church, a cemetery chapel, or an empty lot. Don Bosco would hear their confessions and say Mass for them. An hour of religious instruction would follow, plain, simple talks coming from the heart and embodying the solid truths of the faith. Then the priest would take his band of ragged boys into the country for an all-day outing of games. A final talk would close the "Oratory day," and the tired bunch would trail into Turin, scattering to their homes along the way. Those were heroic times, "those pioneer days," the saint used to call them. "Days of strenuous work they were, a shiftless existence that threatened to collapse any Sunday, a bankrupt enterprise with no capital, and very little funds." Besides this, the city leaders, worried by the new cries of "freedom for the working classes," eyed Don Bosco's boys as a dangerous, half-baked army of the children of the people, headed by an ambitious priest. Actually this tired, penniless priest sought only a chance to bring God's peace and order to the hearts of restless youth. In 1846 the first ray of hope broke through the clouds. Don Bosco bought an empty lot and a dilapidated shed in an underdeveloped section of Turin called "Valdocco." True, next door was a saloon and across the street a hotel of shady reputation--but what did it matter? The Oratory ground was sacred, for as he later learned in a "dream," it was the burial ground of the Martyrs of Turin. The shed he dug deeper and converted into a chapel, with a tiny anteroom, and every Sunday 500 boys managed quite miraculously to squeeze into it for Mass. "The Oratory of St. Francis de Sales," he called it, because he admired the gentle holiness of this great saint. The location of the shed-chapel can still be seen today--the tiny nucleus of a worldwide organization that began in poverty with our Lady's blessing. "He'll stay with us," Don Bosco stated. "But where will he sleep?" Mama Margaret asked. More orphans came. Don Bosco bought the house adjoining the shed. The boarders used to go to work or school in Turin each day, returning "home" to Don Bosco and Mama Margaret for meals, but Don Bosco soon realized that his makeshift system had too many drawbacks and that he had to have a school of his own. One day in 1853 he took a corner of Mama Margaret's kitchen and converted it into a cobbler shop; the tiny hallway became a carpenter shop. The teachers? Don Bosco himself and two hired men. Now there was really no quiet place at the Oratory with all the banging of hammers, but in the midst of all the rumpus was born the Don Bosco Trade School. Not that Don Bosco ever called it that, but that is what the movement developed into. Today the congregation of Don Bosco operates professional training centers and college-preparatory schools throughout the world; both in highly developed countries and in many underdeveloped countries. As Don Bosco's name became famous, more priests came to help him, especially secular priests released by their bishops for this work. 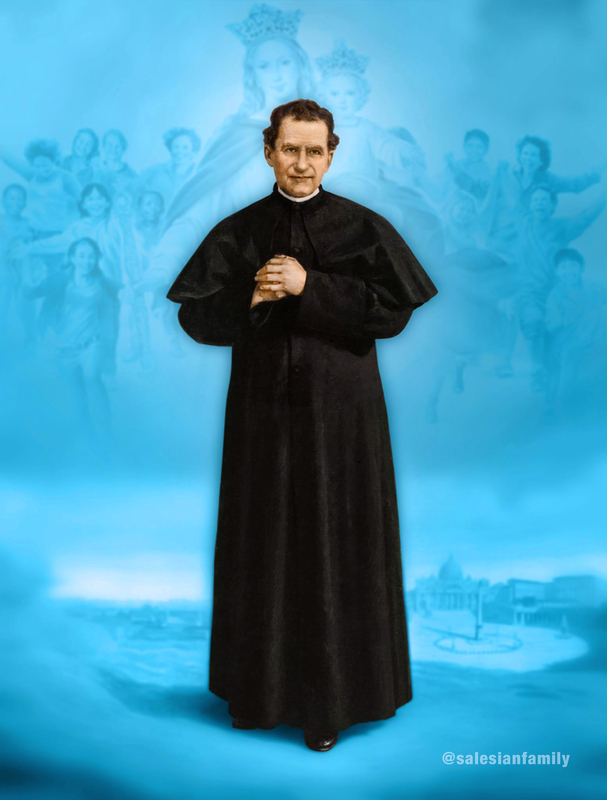 Though they came from different sections of Italy, they soon realized that Don Bosco had an educational system of his own, which he called "the preventive system." The system is not new, though in Don Bosco's hands it achieved a freshness all its own. While it compensates for errors committed by the young, who are often changeable and always forgetful, it does not condone the errors; instead, it uses them as stepping stones to the formation of a solid character, permeated by Christian principles of Christian character. Don Bosco's times were unsuited to the founding of a new religious congregation. Those already in existence were being torn down by a diabolical campaign of political radicals, self-styled free-thinkers. Yet it was precisely a liberal-minded politician who had closed convent doors who first suggested the idea of a new religious congregation to Don Bosco. And so, still under his Lady's guidance, Don Bosco set about the task. His own boys were the best material. Little Michael Rua, who idolized him, tough Johnny Cagliero, hardworking Johnny Francesia, self-willed Paul Albera, and several others. They would be the pioneers in this experiment of a new religious congregation. "I'll do the work of four!" was Cagliero's stalwart answer. The others agreed. On the night of December 18, 1859, was born the Congregation of St. Francis de Sales (popularly known today as the "Salesians of Don Bosco" and officially titled the "Society of St. Francis de Sales"). Rest was out of the question for Don Bosco. Another dream-vision opened a new field of endeavor to him. He found himself in a city square, surrounded by a squealing bevy of girls. They were puny things, unkempt, with starvation in their eyes. "Come to us, Father," they cried, "We need you!" 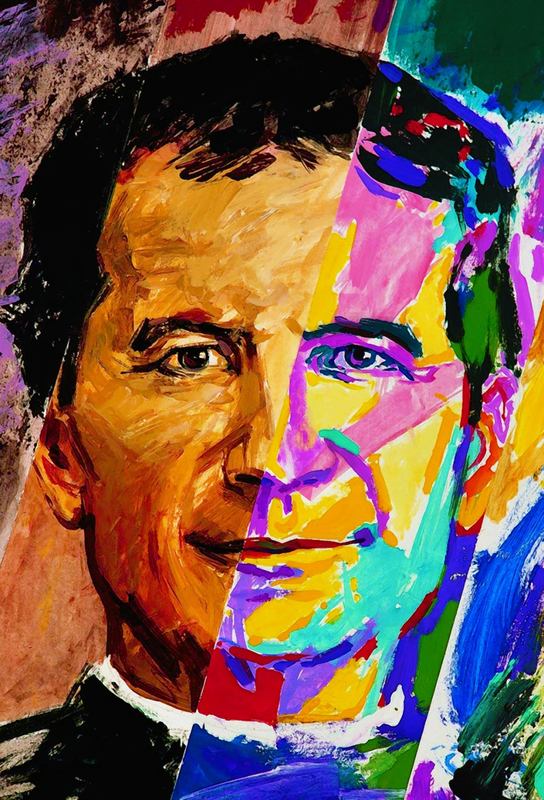 As his main work secure, Don Bosco searched the horizon for new fields of labor. Again a dream-vision revealed God's plans to him. He found himself looking down upon a screaming horde of savages who were massacring a band of white men. From the distance approached a few missionaries, wearing the garb of their orders. The natives turned upon them with wild satisfaction. Terrified by their blood-curdling yells and inhuman cruelty, Don Bosco gasped to see another group of missionaries coming through the jungles, surrounded by children. They were his own Salesians! Certainly they would fare no better than the others, but the yelling ceased. The wild faces became human again. The natives dropped their weapons and sheepishly looked up into the missionaries' faces. Then they bowed their heads in prayer! The young Salesian Congregation ranks highly in number among the Catholic Church's missionary orders. The last years were difficult for him. He was old and tired but he kept up with all the activities of his Salesians, inspiring them to greater achievements for youth. But when he took to his bed in December of 1887, he said, "Now I go to my rest; I shall not get up again." Just before his death, he summoned his sons and begged the favor of their prayers. "Do not ever forget these three things: devotion to the Blessed Sacrament, devotion to Mary Help of Christians, and devotion to (always be in support and come to the defense of) the Holy Father!" On January 31, 1888, Don Bosco's worn-out body finally yielded to nature. With the names of Jesus and Mary on his lips, Don Bosco's soul passed to his God and his Lady as the morning Angelus bell was summoning the faithful to prayer. "Our saint has left us," the people of Turin mourned. As for himself, Don Bosco would say, as he often told his admirers, "I have been an instrument in the hands of Mary. She has done everything. Had I been a worthier instrument, I would have accomplished a great deal more." The original title of this brief story about Don Bosco is "A Man Sent by God." It was written by Fr. Paul Aronica, SDB in 1988 and published by Salesiana Publishers. This revised web version will occasionally be updated with minor edits as time allows for our Salesian Brothers and Priests. The Don Bosco quote graphics were designed by Peter D. Le, SDB. 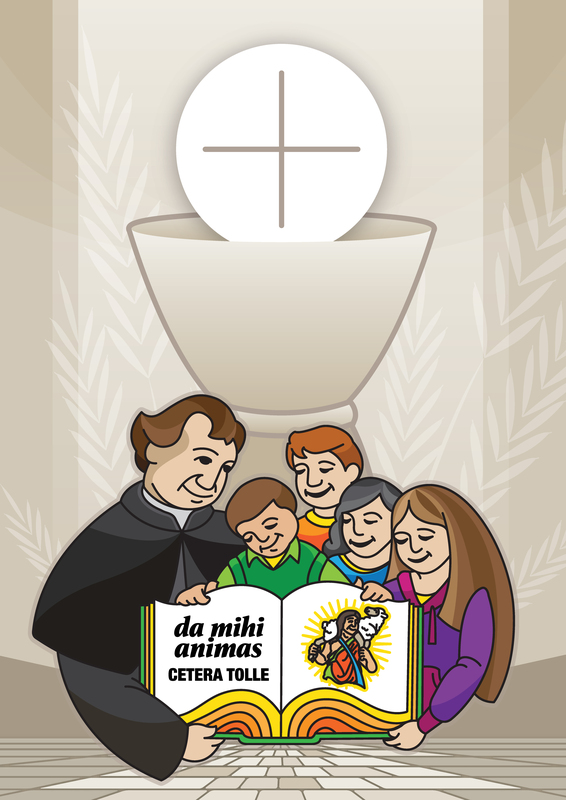 Don Bosco's liturgical feast day is January 31st. St. John Bosco, pray for us and for all the young people in the world! Are you inspired by Don Bosco's life and mission? Visit our section on Salesian Vocations in the Salesian Family.